Looking for cheap car hire deals in Bakersfield, California? Stop searching; you are just a few clicks away from them. Simply enter your requirements, such as the days you need the car, what kind of car you want, and the age of the main driver then launch the online search. Booking online is both safe and easy so do not hesitate any longer; secure your holiday plans by booking Bakersfield car hire for your next trip. Bakersfield, California is served by Meadow Field Airport, also known as Kern County Airport. Direct access to downtown Bakersfield is possible by taxi and metro bus. You may also choose to rent a car directly from the airport. 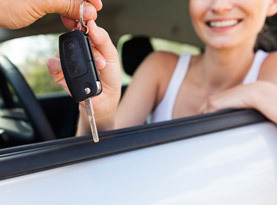 It is recommended to book a vehicle online before arrival so that your favourite car will be ready and waiting. Bakersfield is a lively residential community. It is also endowed with many tourist attractions that are best explored by hire car as they can be far from one another. Interesting places include the Bakersfield Museum of Art and the Buena Vista Museum of Natural History. Many visitors also enjoy cycling along the Kerb River. Attractions easily reached from Bakersfield include the California Living Museum, a modern zoo that allows visitors to discover natural fauna and flora. Bakersfield is also an ideal springboard to the nearby San Joaquim Valley. By hire car, you will be at your ease to visit this splendid area and appreciate its stunning scenery. Bakersfield, California has a fine weather all year, with mild temperatures and no extremes. There is no best time to visit as the weather is good all year round, with the peak season from April to December.